Animal Defenders International : Animals in entertainment : Help end bullfighting in Colombia! 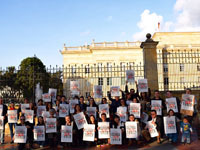 Help end bullfighting in Colombia! ADI and fellow animal protection groups in Colombia, under the coalition Colombia Sin Toreo, are campaigning to ban bullfighting nationwide. 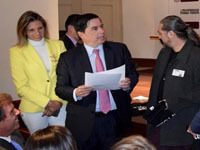 In January 2017 a joint letter requesting that a bill to ban the cruel sport be presented and supported by the government was received by the Minister of the Interior Fernando Cristo and his Vice Minister Luis Ernesto Gomez. The following week, the Minister and Vice Minister indicated their support, announcing a bill would be introduced in Congress. Presented by the Ministry of the Interior, the bill progressed further than any previous initiative, progressing through the House of Representatives with majority support, and then on to the Senate, where it was received favourably in committee. In August 2018, a new bill authored by Representative to the Chamber Juan Carlos Losada was introduced. A parliamentary initiative, it has been signed by numerous congressmen from all political parties and has huge support. This is an historic opportunity to end one of the bloodiest shows on earth. Colombia has made some significant legal advances for the protection of animals. In 1989 the National Animal Protection Statute was created; in 2013 the use of wild animals in circuses was banned through the law 1638; and in 2016 animal abuse was criminalized through the Law Against Animal Abuse 1774. Latin America is becoming a legislative benchmark for ending abuse, however further measures are needed to provide the protection both wild and captive animals need. In the capital of Bogota, bullfights had been prohibited but returned in 2017 after a 4-year hiatus. In February 2017, the Colombian Constitutional Court gave Congress two years to legislate on animal shows. 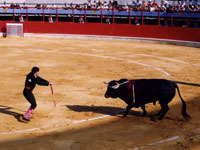 If this deadline was met without the Congress making a decision, several shows including bullfights, and cockfights, would have become illegal in the country from May 2019. Following a change in magistrates, however, this important ruling was overturned in August 2018. Please help end bullfighting in Colombia and animals across Latin America. Urge the Colombian Embassy in your country to support proposals to ban bullfighting in Colombia. Contact details in English / Spanish. Find out what’s wrong with bullfighting. August 2018: Congress said yes to end bullfighting, but ran out of time. February 2018: Momentum builds for bullfighting ban. May 2017: Bullfighting ban in Colombia progresses. May 2017: Historic bill to ban bullfights in Colombia launched! February 2017: Colombia mobilizes against bullfighting. February 2017: Colombian Congress given two years to legislate on bullfights.